Simple wood frame mirror, finished with walnut finish, sealed with 7 layers of protective sealant to ensure water proof surface. 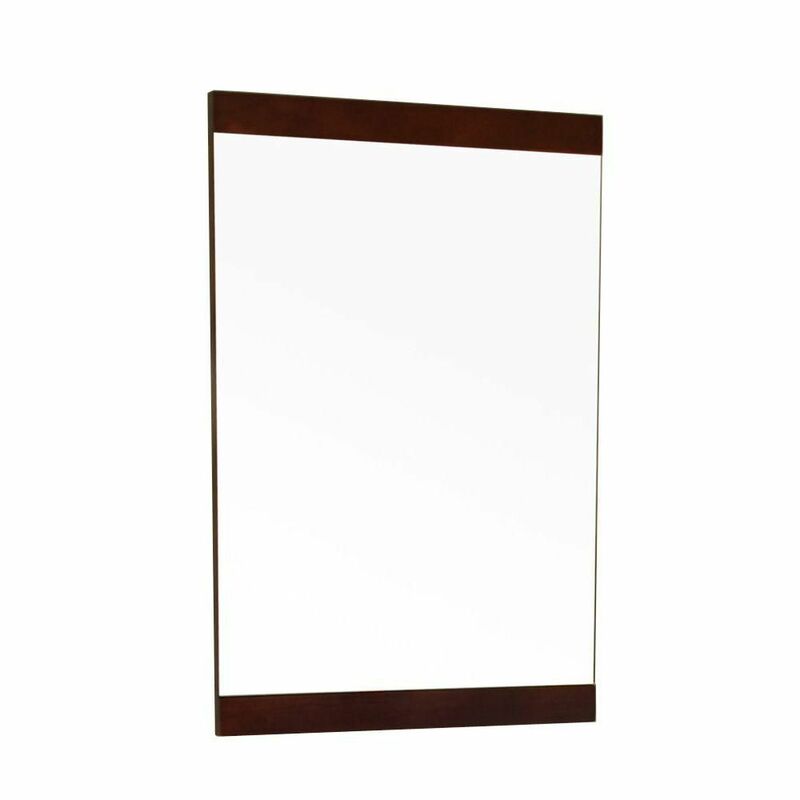 The mirror a high quality 0.6" thick mirror prevent rusting against bathroom, and it comes with all mounting hardware. Wood * walnut * NA * Mounting hardware included * Faucet and mirror not included Faucet and mirror not included. Professional installation recommended. This 22 inch mirror cabinet features a minimalist design that pops with colour thanks to the refined Twilight Gray finish with brushed gold trim. It features a solid wood birch frame and wall cleat for easy hanging. The mirror cabinet is a perfect companion to the Allie / Austen vanities. The Milo Collection brings a dash of contemporary style to your powder room or bathroom. Pair the Milo vanity with this matching 22-inch x 35-inch mirror and you creates an unbeatable combination of style and function. 2 wood shelves provide a place to put your things and the Iron Wood finish pleases the eye. The Lancaster wall mirror combines transitional furniture stylings and a smooth white finish for a clean and beautiful look. Designed to be hung vertically or horizontally. This wooden framed mirror matches the Lancaster Vanity Collection for a coordinated look. The Merola Tile Lustre Beveled Antique Mirror 3-inch x 6-inch Glass Wall Tile is the perfect unique addition to your home. Featuring a mirrored front surface, this piece is great for reflecting light and color from throughout the room. The beveled front helps to add more dimension and interest to this already intriguing piece. The random brown and taupe patterns throughout help give some color to this mirrored piece. This piece is great for use on walls in bedrooms, bathrooms, backsplashes and as accents to other products. Aurora 32-inch x 20-inch Solid Wood Frame Wall Mirror in Dark Walnut with Mounting Hardware Simple wood frame mirror, finished with walnut finish, sealed with 7 layers of protective sealant to ensure water proof surface. The mirror a high quality 0.6" thick mirror prevent rusting against bathroom, and it comes with all mounting hardware. Wood * walnut * NA * Mounting hardware included * Faucet and mirror not included Faucet and mirror not included. Professional installation recommended.